Show us How You Style Your Prosecco! Mionetto and Food & Wine Magazine are on the search for those who share our passion for creating high quality Prosecco cocktails made with Mionetto Prosecco. 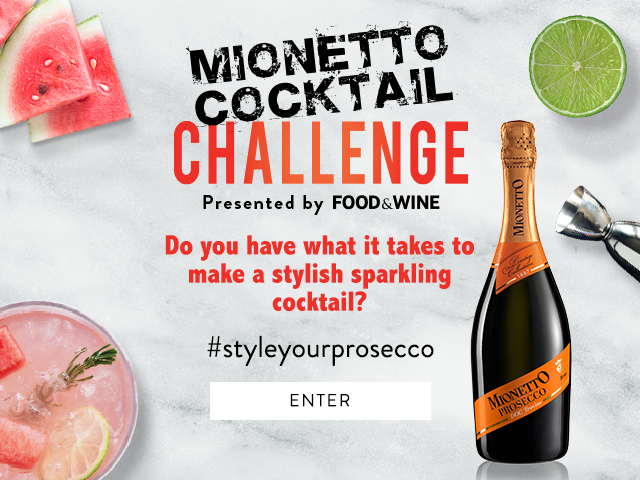 Submit your best original Prosecco cocktail recipe for a chance to show off your skills during the final Mix-Off at the Food & Wine test kitchen in New York City. The top three finalists will compete within their category to determine one consumer and one bartender champion. Our judges are looking for fun and creative recipes that go beyond the traditional sparkling wine cocktail, so get mixing for a chance to win! Don’t forget to check out our past winner’s recipes and our recipe library to get inspired. We are excited to see how you style your Prosecco! NO PURCHASE NECESSARY. MUST BE 21+. CLICK FOR DETAILS. CHECK OUT THE 2016 COCKTAIL CHALLENGE MIX-OFF!